Music has always been our guest’s passion. Dalton Dellsperger, founder of the TownWave app, was an independent hip-hop artist, performing across the country and consistently putting out content, when he realized there was a problem. There were zero platforms willing to help independent musicians succeed. Sure, you can upload your music to big platforms, but NO ONE provided a way for musicians to get their music in front of listeners that are near them and who they should be interacting with ... Más informaciones and reaching in order to increase that local buzz for their music. 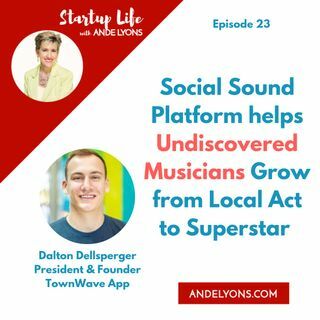 Like many founders, Dalton decided to fix that problem and created TownWave, a social sound platform that allows for local musicians to reach new listeners nearby or in targeted regions. Townwave’s goal is to level the playing field for musicians and help them grow their fan base organically. The app aims to empower musicians of all levels and allow them to develop a local buzz and eventually expand outwards. Within the app, artists are able to upload music, target new listeners and use tools to better understand where their songs are doing well. TownWave even built a social network within the app to allow for immediate interaction between artists and the new listeners they reach. Dalton’s role as the President and Founder is to recruit users, develop the brand, expand its local presence, manage social media, and run all live event production and promotion. The TownWave app is available for free download on all mobile devices, in 5 countries: United States, Canada, United Kingdom, Australia and New Zealand. Dalton currently resides in the live music capital of the world, Austin, Texas. You'll find him attending local showcases or hosting them and doing just about anything to help local musicians succeed. I ran into Dalton at my favorite social media bar… Twitter… and am so delighted he agreed to share his startup stories with us. Bootstrapping, delivering on TownWave's brand promise, recruiting a talented CTO, creating customer experience, and managing his mindset - Dalton brings insights and action steps for founders of all industries. I don't have any business experience in my family. I don't know anyone in my family who's a business owner or anything, so sometimes you don't realize that it's going to be a huge learning experience. To some, it may qualify as a loss, but you have to just treat every down or loss as a true learning experience and a stepping stone to getting to where you're supposed to be. I would rather fall on my face three or four times and know that it's getting me closer to that one break that's worth it. That's why baseball is my favorite sport. You strike out two out of three at bats and you hit a home run and you can win the World Series. No one will talk about the two strikeouts. If you are a musician/band/local artist ... or know one... who would like to organically expand your sound and reach new audiences, please visit: https://townwave.com/. If you need startup mentoring – please visit my website, http://andelyons.com where you’ll find all the ways I can add value to your startup journey: strategy calls, pitch deck and one page business snapshot coaching, WBENC application support for women business owners - I’d be honored to mentor you through whatever you’re going through – so please don’t hesitate to reach out. If you’d like to receive an alert whenever I post a new episode, please follow me on Spreaker Stitcher or Google Podcasts… and let’s connect on social media! Listeners - thank you so much for tuning in - I am genuinely grateful for your time and presence. Stay strong, stay focused – and please remember – you’ve got this – Cheers!